It doesn’t matter what type of work you do, if you have to communicate with people, it’s vital you are able to do it well. We’ve put together the following dos and don’ts to help you build and deliver effective messages. The first step is to make sure you can explain who you/your organisation are and what you do, in a simple and clear way, this might not actually be a specific message but it’s something you will need to communicate well. Specific – your message should be something that even your close competitors can’t also claim. Varied – different products/services/news you want to communicate will likely all need individual sets of messages. 3s – don’t push too many messages at once, 3 at a time (e.g. in an interview or presentation) works well. Tailoring – think about the different audiences you want to communicate to; they may each need a slightly different set of messages or evidence to really buy-in to what you are saying. Interesting – is your message; new, compelling or unusual? If not then it may just be overlooked by the audience. Clear – a complicated message is not a good one, use simple language. Concise – your overarching message/proposition should be a short statement – if it isn’t, it needs editing down. Support – you have to back up the message with evidence and this support can be in a number of forms e.g. anecdotes and observations, as well as facts, research and stats (ideally; try to add stories/examples of real people to your evidence, this will help the message connect and be remembered). Call to action – it should be clear what you want the audience to do, or to think, when they hear your message. Convincing – don’t forget that your message should persuade and win-over your audience. Cut out jargon – it will lose the audience. Test it – check that it resonates with colleagues and external parties – apply the ‘so what’ test to it yourself. Consistency – make sure all your staff/spokespeople know the messages and are all communicating the same story. Journalists – avoid using the word ‘message’ in media interviews, journalists might be put off by the term. It’s not easy to create your messages, spokespeople and presenters are often too close to their stories to boil down what’s important to an external audience. Our messaging training will help your team to build, solid, memorable messages that will successfully communicate what’s important to you. We can help you test the messages for a range of presentations or media interviews so you are ready to reach your audience whatever the platform. 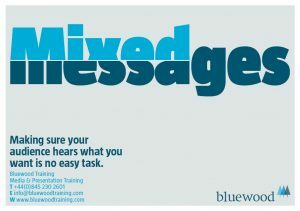 To find out more about our messaging training please get in touch.